When you first start wushu you are in a bit of a bubble, and especially for me, since I didn’t have access to all these wushu videos online, I only had the advanced students at my school or at tournaments for comparison. You assume that the highest level you see around you is pretty close to the highest level you might get to, and even though you have heard that Chinese athletes are really good you don’t really realize just HOW good. Until you see them. Then your mind is blown out of the water. The disparity seems so great. How can athletes get that good? Its like a completely different level. A whole ‘nother universe of ability. For years I used to wonder what their secret was. I would hear people talking about it, discussing it and contemplating their training regimen. Even those people who had gone to China to train didn’t initially understand it. And especially when you see it right in front of you and feel the power that their movements have, you can’t even grasp the journey it would take to get you from where you are to where they are. Asking athletes why they are so good brings out a whole range of responses, from the humble (“my wushu still has a long way to go”) to the arrogant (“because I’m the best”) to the racist (“because Chinese are better”) to the cryptic (“because the philosophy of wushu is reflected in the eyes of panda bears”) and everything in between. But they don’t actually give you the secret to what makes them so amazing. Even just a bow stance (弓步) has a totally different feel to it when these athletes do it. Of course, most people will just say that it is because they have so much training from such a young age and that if anyone was to get subjected to that much time in the wushu guan they would probably be just as good. But is that really true? Is time all you need to be as good as Chinese athletes? Well … yes and no. Time is a very important element. In fact it is probably one of the most important elements. But I wouldn’t say it is the only reason why Chinese athletes excel to such a degree. When people talk about the definition of “kung fu” or “gong fu” (功夫) as a measure of skill or mastery the inherent implication is that it is really a measure of time. The longer you spend doing something, the better you will be at it. But the other part of that “gong fu” equation is related to both “effort” and “intention”, or as I like to say it “intensity”. One of the other main factors that Chinese athletes have going for them is that they are not only spending a lot of time training, but their training is of a very intense nature. As you can imagine, an hour of training in a Chinese school is a very different level of intensity from an hour of training in many schools in the West. So, is that what it boils down to? Intense Action over a long period of Time means you will be amazing at wushu? Well, that might get you a good part of the way there, and many athletes who are very good at wushu have done this and been quite good. But this is only if you consider the purely physical aspects of wushu. There is more to wushu than meets the carpet, and if you ignore the mental parts of training, then you are missing half the picture. A coach is without a doubt one of the most instrumental influences in your wushu development. Without a good teacher your skill can only get to a certain point. (And, may I add, the coach who realizes when their student has surpassed what they can teach is a wise person indeed.) All you learn, at least in the beginning, comes from that fountain of knowledge. So what separates the Chinese coach from other coaches? Strictly speaking it is access to resources. Not just material resources, but educational and scientific resources. They are constantly required to be knowledgeable about the best training methods and techniques. You always see athletes in China training with new methods before anywhere else in the world. Remember those spinny turns into the splits that they practice for their inside split landings? Yup. China started that whole thing. It is like in web design. There is a big difference in abilities between the web design company located in Silicon Valley vs. the web design company located in Billings, Montana (no offense Billings), because they are in the environment where the latest technologies and resources are being developed. Those with access to new information are often the quickest to benefit from it. But it isn’t just that coaches in China tend to have those resources, but it is also the resources available to the athlete. No, not the latest Nike Shaolinquan shoes, or the coolest looking silks, but I’m speaking more about resources through which they can develop an understanding of high level skill. Many experts talk about the importance of modeling one’s self after those who are already in the place you want to be. And this makes sense since your development of a skill is accelerated if you have someone to observe who is able to do what you want to do. When foreigners come to China and train next to the pro’s, their understanding of technique improves because they are able to see the correct way to do it, but more importantly they are able to take that observation and immediately work on modeling it themselves. I remember that it wasn’t until my trip to China in 1999 that I felt I really was beginning to understand the feeling of wushu. That it was more than the sum of the parts I was putting together. It is like the saying that you improve in something the most when you play against people who are much better than you. It forces your game to raise to a new level. Now, in China these athletes are in a position where they can constantly model themselves after higher level athletes. The kids in a wushu guan are training right next to athletes who are miles and miles above their own skill level. And they are able to observe and absorb what they see the entire time they are training. It isn’t just that they are training consistently and intensely, or that their coaches have the latest information, but they can look right across the room and model themselves after the best in the world. So, thats it, right? You train intensely and consistently for a long period of time, and add to that a coach with resources and the opportunity to model those who are better than you, and you end up with the crazy amazing Chinese professional wushu athlete? Well, not quite. Because this is where you start to separate the wheat from the chaff and make the distinction between those athletes who are just really good, and those who are truly great. There is a reason why athletes in China get weeded down so much over the years. From the 100 or so who might start training together as little kids maybe 40 of them will continue on for more than 5 years. And of those who are there in their tweens, maybe another 15 go on to become teens with talent. But to get to the level of a national champion or someone with world-renowned skill, you have to scale it down even farther where perhaps 1 or 2 out of 100 kids end up really achieving that level. Why is that? Well, to be honest, certain athletes just have a little more going on between the ears. No, I’m not talking about being “smarter” than other people or having a higher I.Q., but I’m talking about the level of mental energy and concentrated attention that the athlete spends on really understanding the intricacies of wushu technique. It isn’t so much a measure of intelligence as it is a measure of curiosity, because the athlete who is always working to understand wushu and thinks about wushu as more than just a series of movement; who puts together a story with their movements and paints a picture with their technique — then that athlete is at a different level than the one who just copies greatness. Because it isn’t enough just to model yourself after someone who is amazingly good. In order to achieve that higher level you have to create greatness within yourself. It is the spark of creativity — of creating something unique that has never before been seen in the world — that is the mark of greatness. And I’m not talking just about choreography. Having unique choreography without having creative intelligence in your wushu is, as Shakespeare said, like a story being told by an idiot, full of sound and fury, Signifying nothing. You need to make a statement with your wushu; about who you are and what you understand and what is important. It is no different than writing music, painting a picture or writing a novel. If it doesn’t come from a real place within yourself, then it is just a simulacrum; an empty shell filled with a lack of understanding and too much hot air. So, we are almost there. But in my book there is one more ingredient that separates many great athletes from the rest of us common folk. And what is that final ingredient? Well, it has to do with one’s standards of excellence. The athletes in China don’t really know any standard other than that of being the best. They are surrounded by athletes who have the highest level in the world and train with them every day of their lives. They have no option but to accept that the level they see around them is the base level for a wushu athlete. 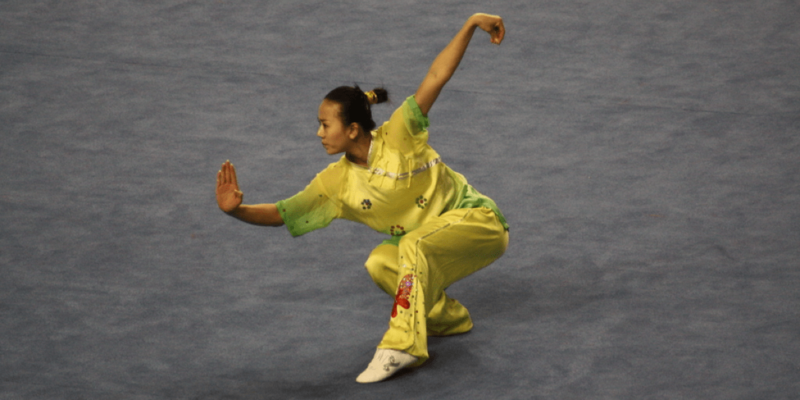 There is no “intermediate” wushu athletes on a professional team. “Advanced” is considered the starting point and you only go up from there. It is as they say: if you believe you can or can’t, you are right. One’s belief system about the world and about themselves dictates their reality, and if your belief is that the lowest level of acceptable wushu is (by our standards) perfection, then you will tolerate nothing less. It isn’t even an option for them. It is just a given. Like the sky being blue or water being wet. Wushu is supposed to look like that, plain and simple, and if it doesn’t, then you aren’t doing wushu. Intense Action over Time when added with a Coach providing the latest Resources and the Modeling of excellence, is multiplied by one’s Creative Intelligence and high Standards. But then, what does that mean to the rest of us? And how is this applicable to the average Joe (or Joan) who is the weekend wushu warrior far away from China? Well, lets look a little more carefully at how our world compares with those of the Chinese athlete. Of those aspects of the equation, which ones apply to us? “Intensity” is also a tricky one for many of us. We are often in schools where the other students are not as dedicated or interested in wushu as we are. Or perhaps they are just doing it for fun. Be that as it may, our intensity level does not have to be dictated by the whims of others and if you don’t create an intense training environment for yourself (even if it is in your own head), then waiting for someone else to do it for you can be a long time coming. You can create the intensity for yourself, even if your environment doesn’t provide it. So it is really only limiting if we allow it to be. Another factor that limits many of us is “Resources”. Many of us aren’t in China and don’t have access. Or we don’t speak Chinese so even if we had access we wouldn’t understand it. This is one of the reasons having a good Coach is very important. Often they have an understanding of the technologies and developments of wushu that we do not have access to. And even if you don’t have a coach on a regular basis, taking full advantage of whatever resources you have (online, seminars, instructional videos, etc) can go a long way. And finally I think that “modelling” has been an issue for a lot of people too. I remember when I first started that the only people I had to model myself after were those that had been doing wushu for just a few years longer than myself. Then it was up to the coach to show us what good wushu was supposed to look like. But thanks to the advent of these series of tubes we call the internet (brought to you courtesy of Al Gore) you now have access to the best wushu athletes and the highest standards of excellence that ever existed. I would never say that youtube should be a substitute for a good coach, but it can help you find those upon which you can model your own training. Not quite as good as being in the same room as Zhao Qing Jian, of course, but it is better than nothing. And there you have it. The aspects of training that we ALL have the ability to develop, regardless of our situation. We might not have a lot of time, or a coach, or access to resources or those we can model, but we do have some of the most important elements of what gives Chinese athletes their unique abilities. You can create an intensity of training for yourself every time you step in to the wushu guan (or gym or park or wherever you are). You can train and take action to improve yourself regardless of whether or not you are in China or have a coach. You can utilize your own creative intelligence to develop an understanding of the intricate details of wushu. And you can raise your standards so that you accept nothing but the best from yourself. If you develop these aspects of your training methodology, then when you DO have those other resources, coaches, available time or models of excellence, you will be able to take full advantage of them. The great thing about developing these attributes is that it doesn’t just apply to your wushu training, but it applies to all areas of your life. And the skills you develop in honing these skills will benefit you in so many more ways than you can imagine.